When you talk about muscle cars and which are the good and bad picks, there are so many to choose from, as the breed goes back decades. In this category you can basically lump in pony cars, which include the Ford Mustang and Camaro and even from these two models there’s a huge variety to choose from. Like any breed of car, there are some general guidelines to follow for which are the good and bad years, the engines are models to look out for and even certain options. But there are even caveats to what are considered the bad years of certain models, where people have given the utmost care to their vehicle and got the most from what they had or even converted them into something better. Generalizing, 80s and 90s aren’t exactly known for their outstanding performance, but many have been given upgraded powertrains, suspension and brakes and turned into a completely different beast. The upside of this route is that they are far cheaper than other models to buy into. One of the overall considerations with vintage models is dealing with technology that is over 30 years old. This means no matter the make or model, it’s going to need a lot more TLC and constant maintenance there anything made in the last 10 years. In that respect, problems that were inherent in the original car, may be problems that arise in any vintage vehicle. It just goes with the territory. So, here we move on to some of the general muscle cars which are considered good and bad picks, like if you were in the scenario of just laying down your cash and driving away a well maintained vehicle. If you want to really generalise about the good and bad, its generally accepted that the late 60s and early 70s muscle cars are the best picks for classic designs any huge displacement engines. The 80s and 90s had a few standout vehicles depending on your preference, but then we’re into the 2000’s and beyond for when the modern movement of muscle cars started to take hold with just as big displacement and modern handling. These ‘buys’ and ‘avoids’ are generalisations as it’s always down to the individual vehicle, how they are maintained and what you get out of them personally. Buick Regal Sports Coupe – the second-generation models brought out some classics like the Grand National and GNX, but the Regal Sports Coupe was not in the same ballpark. Loads of maintenance and a luxury car with not the greatest performance. Pontiac Grand Prix – quite a modern and stylish front-end, but too much torque for its platform and didn’t have the greatest of handling. Early 80’s Chevrolet Camaro – the Fox body Mustang started to come into its own by the end of its generation, but the 1982 model was seriously underpowered. Like many Fox bodies, much better to replace the drive train and turn it into a street racer. Chevrolet Monza – the car has a Italian Grand Prix circuit name, but an in line 4 made it weak and not the greatest with handling. Second generation Mustang – it seems around the mid-1970s to the early 80s, muscle car design and engines just lost the plot. sleek designs turned into….well, something else and engine performance dropped like a stone. The Mustang II is an example of this – a V6 with weak performance and handling. Chevrolet Vega – it tried to look like a second-generation Camaro, but was plagued with problems and was poorly built. Mercury Capri RS Turbo – the same powertrain as the Mustang, but had terrible styling and design. Europe ironically had their own Capri from Ford at the same time, which was a success but really didn’t like the rain…..
Second generation Dodge Challenger and Charger – By 1975 it was almost like Dodge had a bang on the head and had completely forgotten how to make a muscle car. Both models tried to go down the luxury route with weak engines and completely different designs. Definitely the wilderness years. Seventh generation Chevrolet Impala – the great vehicle of the late 60s and early 70s eventually suffered like the rest of the muscle car market, from emission controls, higher insurance and stuffed with smaller engines. But by 1994, it turned into a front wheel drive machine and a shadow of its past designs. First generation Ford Mustang – this era produced the classic designs we know today and with many examples produced, even the base models are a classic to own. They also benefit from having loads of parts available to buy. Second-generation Chevrolet Chevelle SS – a 1969-1970 with either a 396ci. or 454ci. V8 is arguably one of the most classic and iconic muscle cars around. Gorgeous design and huge, powerful engines. 1963 Chevrolet Corvette – the Sting Ray is a classic vintage design, with the 1963 model hitting the nail on the head for sleekness and performance. 1970 Plymouth Superbird – although they didn’t sell very well at the time, it is now one of the most standout muscle cars with such a recognisable design. You will need deep pockets to buy one in good condition these days. Dodge Charger Daytona – just like the Superbird, this winged warrior is now an ultra rarity, especially with a Hemi engine. Distinctive design and amazingly fast for its time. 1987 Buick GNX – the 80s wasn’t a great time for the muscle car, but the Buick GX stood out with great performance and a distinctive 80’s look. A collectors item today and highly distinctive. 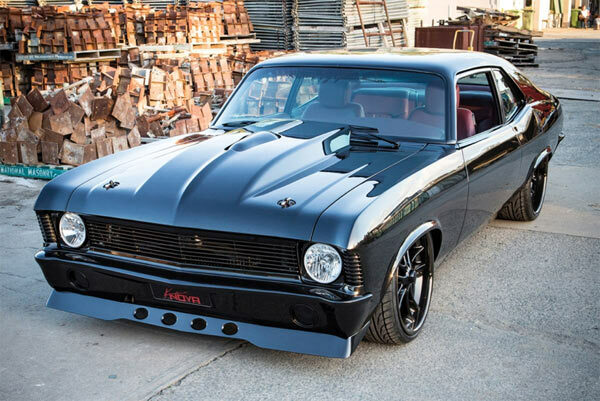 Chevrolet Nova – The great thing about the Nova is that its a great platform to be customised. A simple design and a solid performer, the best being the third generation vehicles. There are also plenty around for reasonable money. SS models being the most desirable, like many Chevy’s of the time. Second generation Dodge Charger – the 1968 to 1970 Dodge Charger is probably one of the most recognisable muscle cars. With a 440ci. V8 it’s definitely the poster boy of this era of muscle cars. Plymouth Barracuda – the third generation, going in pecking order from 1970-1974 are a classic design in the muscle car world and fetch some of the highest prices. You’ll need deep pockets to get hold of one of these. Plymouth Road Runner – The Roadrunner is almost the standardbearer for the muscle car. Running from 1968 to 1974, the first two generations embodied everything you would want from a muscle car. Muscular looks and huge engines. The most distinctive probably being a 1969 or 1970 model with a 440ci. or 426 Hemi V8. There are clearly loads more models which have to be evaluated on their own individual merits. These also include modern muscle cars from both Ford, Dodge and Chevrolet. Ford with the GT, GT350 and GT500, variations of the Dodge Challenger and Charger like the Hellcat and Chevrolet with the Camaro ZL1. Modern examples of muscle cars may be a better choice if you don’t want the ongoing maintenance of a vintage vehicle, but you can’t beat those old school muscle car designs and if well maintained can last you a lifetime.